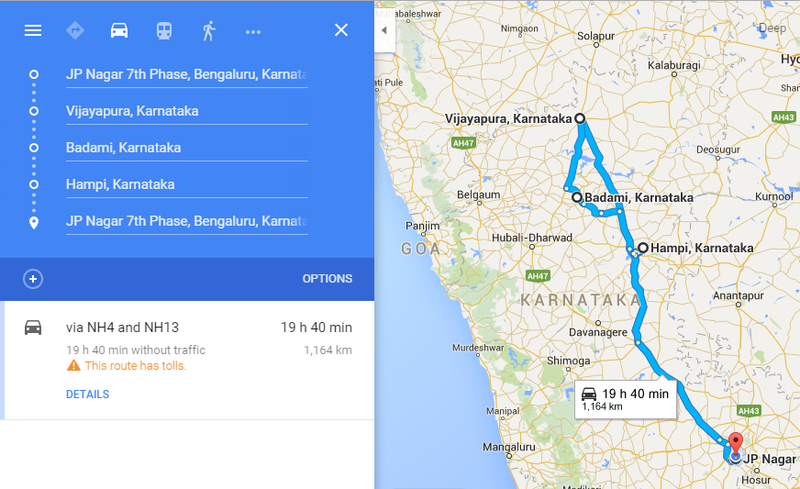 It was Diwali of 2015 and we decided to take some time off and do 5 day road trip to North Karnataka. Decided to visit these cities in particular Bijapur, Badami and Hampi. I booked a nice and comfortable XUV W6 ZoomCar for this trip. Before the trip, I had very low expectations from the places we were visiting. I thought, mostly we will see almost destroyed and not well kept monuments. But, was I in for a pleasant surprise! The places were extremely well kept and monuments were beautiful and showing off their glorious past! The route we had taken can be found here, round trip of around 1200 KM in 5 days and I was very much looking forward to have a nice time on the road! 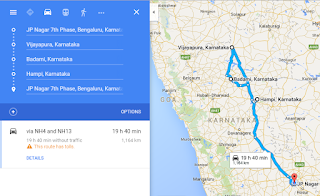 First day was mostly driving from Bangalore to Bjiapur, around 550 KM. We started at about 0730 hrs, it was only 1630 hrs and we were only 70 KM away from Bijapur. We took a slight detour and visited the Almatti Dam. Its a beautiful dam with easy access to the dam's reservoir. One could take a dip into clean dam waters and have some fun. Were luck to see a beautiful sunset at the reservoir! The dam also has a beautiful and super well kept garden with lots of fountain and lights and stuff. Spent the evening there and we resumed our journey towards Bijapur. It was Diwali day, all restaurants were closed by the time reached Bijapur - at about 2030. We had tough time finding dinner, but eventually we did find one Restaurant who was ready to cook something for us. It seems there is some tradition, all restaurants close their kitchens after the Diwali Puja is done - obviously I didn't know about it :P.
We crashed into the bed soon after dinner, next day was all jam packed and we were very much looking fwd for it! In the next post, will describe what we saw at Bijapur.